You are here: Home > Frequently Asked Questions about Bamboo Boards, Plywood Panels & Bamboo Flooring > Why Choose Bamboo? It wasn’t all that long ago when Mink coats were all the vogue – now? One struggles to find even a synthetic Mink coat – why? More and more people are realising the need to be good stewards of our planet and it’s resources. We are starting to realise our responsibility to protect what we have (left) for future generations. Just as Mink coats are no longer considered acceptable (for obvious reasons), we believe that the same will begin to apply to using our natural forests in the way we have become accustomed. Harvesting wood from these forests at the rate we are currently doing, will eventually lead to their extinction. Something we cannot afford. Using solid woods, in a sustainable way, is becoming harder and harder to manage as the demand outstrips the supply. Many consumers of raw wood materials are finding it harder to get solid wood planks that are either long enough or mature enough to use in their manufacturing. Consider the prevalence of cases such as “blood Meranti” where the natural habitats of animals are devastated and the animals killed during harvesting, these solid woods are then “laundered” through different countries to clients, stamped as “responsibly harvested raw materials”. These practices are not sustainable. Rapidly renewable – only takes 4-5 years to mature, whereas solid woods typically require 12-80 years to mature. Sustainable – Bamboo is technically a grass. It has a rhizome root system, so when a tree is harvested, it’s good for the plant & a new shoot takes it’s place; no replanting required. Mao (also known as Moso) bamboo, the species used for bamboo flooring & boards is environmentally friendly. It is not eaten by Pandas or similar endangered creatures, so no animals are endangered when the bamboo trees are harvested. The most moisture tolerant of solid woods. Hard – laminated solid bamboo is typically as hard as Red Oak & Strand Woven bamboo is the hardest baring Brazilian Teak. 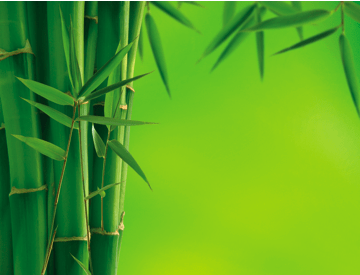 Strong – Bamboo has a higher tensile strength than cold pressed steel. Stable – Bamboo is the most stable of solid woods. That means you don’t have to “wrestle” with the planks to get them to do what you want them to do. We encourage you to explore our web site and discover for yourself how versatile our bamboo products are and how you (and as a result the rest of our planet) can reap great benefits by moving to bamboo as an alternative to solid wood.